Zuraya Tapia-Hadley currently serves as Manager of Public Policy for Facebook. 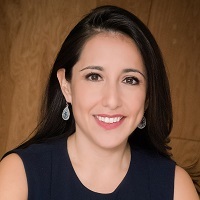 She is responsible for the company’s advocacy and relationships with Members of Congress, namely members of the Ways & Means Committee and the Congressional Hispanic Caucus, among others. Prior to Facebook, she served as a Principal at The Raben Group, where she advised U.S. and international clients in the non-profit and private sector on how to navigate the Washington, D.C. political and policy arenas; develop engagement strategies with communities of color; and diversity and inclusion strategies. Previously, she was Vice President, Government Affairs for UPS, where she managed relationships with Members of Congress for the company, advocated on Customs and trade issues in the U.S. and Latin America; and developed outreach strategies with national Latino organizations. Zuraya began her career as an attorney in private practice at Pillsbury Winthrop Shaw Pittman, and previous professional experience includes leading national and international Hispanic-serving organizations, including as Executive Director of the Hispanic National Bar Association (HNBA), and experience in the U.S. Congress as staff for the House Committee on Small Business. She was named one of the “Latina Leaders to Watch” by the Congressional news publication “TheHill”, and one of the “Top Latinos Under 40 Impacting Foreign Policy” by the Huffington Post. She also served on the Governor of Virginia’s Latino Advisory Board under Gov. Tim Kaine and Gov. Terry McAuliffe. She earned a Master of Laws (LLM) from Georgetown University and her undergraduate degree in law from the Universidad de las Americas Puebla in Puebla, Mexico.